Department stores are already struggling as they face declining numbers of customers and on Tuesday and Wednesday were hit hard again by two brands that are considered big lures for department store shoppers. On Wednesday, Michael Kors announced it would lower the quantity of merchandise it sends to department stores. Coach, on Tuesday, said it was planning to pull purses and other products of its brand from 250 department stores or about 25% of brick and mortar locations. The two brands announced that the deep discounting that is now common amongst department stores had cut into their margins and the perceived cachet they have with customers. John Idol the CEO at Michael Kors said it was creating much confusion amongst the minds of consumers in relation to the value of our brand. He added that the company needed to correct something it thinks is having a long term negative effect on its brand. Coach CEO Victor Luis echoed the complaint of Idol saying that the high number of promotions will be damaging to the long term health of the company’s brand. These damaging announcements for department stores comes as they, as well as malls in general have seen their popularity and importance plunge amongst consumers in the U.S. Macy’s, Sears, Kohl’s and Nordstrom all have reported disappointing earnings for the first quarter. One online retail research group said that department stores were currently holding on with their fingernails over the edge of a cliff. He added that many shoppers have stopped shopping there and more continue to stop. Shoppers, said one Wall Street industry analyst, who prefer going to physical stores have started to shift towards specialty retailers and malls that are offering experiences like dining and outdoor entertainment. As shopping centers and many department stores cut back on their customer service, the consumer has become upset in general with those places. Many shoppers have now opted for shopping online due to its convenience. At one time, the mall was looked at as the town square in America, but recent figures of sales reveal otherwise. Americans are continuing to shift from mall shopping and spend more time shopping online and socializing. At department stores, the Michael Kors brand will not participate any longer in family and friends’ sales and will not be accepting any coupons. 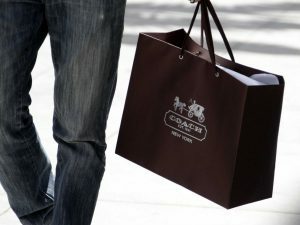 Coach announced it would tighten up the level of the markdowns it will allow.